Curiosity can be the progeny of a positive and empowering journey for individuals, particularly teenagers. Regardless of our gender or age or circumstances, questioning everything that goes on around us will and can benefit everyone involved. The thirst for knowledge and questioning practices that inform our world views can also inform transitions, be it a personal or even a national one. Attitudes and mind-sets which continuously evolve because of incessant questioning will eventually support transitional phases with innovation. Men and boys are critical to behaviour change that can create an enabling environment for inclusive progress, for progress that leaves no one behind - we all have a role to play in national development but fundamental to economic prowess is a healthy, equal population base. Speaking to students who attended the 2016 World Population Day (June 12) Inspirational Stories Collection talanoa session in Suva, Ministry of Youth and Sport permanent secretary Alison Burchell urged her young audience towards a culture which supports Fiji's development. With Ms Burchell was dual national rep Lusi Biukoto who shared her struggle during her early tertiary student days, juggling studies with a young family and between trainings as a basketball and netball Fiji rep.
Ms Biukoto who returned from South Korea this year (2016) with a Master's Degree in global sports management, the first and remains the only woman in Fiji to have this qualification, encouraged students to push themselves above perceived limits. Ms Biukoto, who has a Bachelor of Commerce in tourism management and a Bachelor of Arts in information systems and management from the University of the South Pacific, had two of her three children while pursuing tertiary studies. "The choices you make determines how far you reach," Ms Biukoto who has been a member of the Fiji Pearls netball team since 2006 told students. 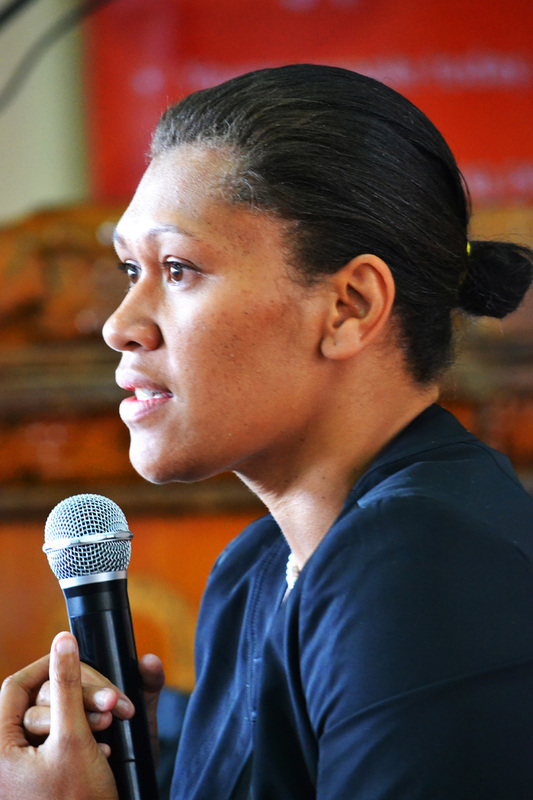 Ms Biukoto began representing Fiji as an under-17 representative. "I never dreamt to go to South Korea but God is good. Be good to your parents - they know what they are talking about. "They may want a pathway for you but look within yourself and find your strengths and work towards that but talk to your parents about it. Help them understand change because we are in a new global environment." The 2016 World Population Day (WPD) theme was "Investing in Teenage Girls". The United Nations Population Fund, UNFPA, believes investing in adolescent girls will be critical to real progress in the achievement of the Sustainable Development Goals (SDGs). WPD, as a United Nations calendar event, was triggered when the number of people in the world reached 5 billion. The governing council of the United Nations Development Program (UNDP) established the event in 1989. The SDGs calls on member states not to leave anyone behind. When we ignore situations which are barriers to girls reaching their full potential, we are guilty of leaving behind half of humanity. Teenage girls in Pacific Island Countries and Territories, as those around the world, face more and greater challenges than their male peers. In almost half of PICTS, 10 to 19 per cent of girls are married between 15 and 19 years of age, twice as much as their male peers. Adolescent pregnancy rate is over 30 pregnancies per 1000 adolescent girls in 12 of the 15 countries, with five of them having between 62 and 85 births per 1000 adolescent girls. Investments are needed to protect their health, including their sexual and reproductive health, to enable them to receive a quality education and to expand economic opportunities, including those for decent work. A teenage girl whose rights are respected and who is able to realise her full potential is a girl who is more likely to contribute to the economic and social progress of her community and nation. When a teenage girl has the power, the means and the information to make her own decisions in life, she is more likely to overcome obstacles that stand between her and a healthy, productive future. This will benefit her, her family and her community. When she has no say in decisions about her education, health, work or even marital status, she may never realise her full potential or become a positive force for transformation in her home, community and nation. Investing in girls will harness our countries' capacity for a demographic dividend which is a situation where those in the workforce number more than dependents. Ms Burchell, who encouraged a mentoring system, reiterated Government's intentions of "leaving no one behind" challenging students to contextualise it and discuss the implications among themselves. Students were challenged to think about how constitutional provisions of basic human rights, including gender equality, could be translated into everyday lived experiences. "One of the main reasons you need to be able to make decisions for yourselves, both girls and boys, young women and young men, is because we need people to contribute to the economy of Fiji," Ms Burchell said after referring to the crippling impact an unplanned pregnancy could have on people's lives, denying those involved their full potential to be salary earners and/or taxpayers. When standing up against manifestations of inequality like violence against women, Ms Burchell encouraged an approach that not only called such behaviour out as wrong, but also explained why it was wrong while offering alternative ways of resolving issues without violence. Speaking from the heart, Ms Biukoto emphasised the need for students to stop looking down at themselves reminding students at the talanoa circle that "you are counted and you must count yourselves". "We need to invest in teenage girls because they play a key role in our tomorrow. Girls and young women play a very important role, we are the main transformers in our families and communities," Ms Biukoto said. "Push yourself above the limit, never settle for less."